This book is actually translated from the original Japanese edition DUEL ART 高橋和希 遊戯王イラスト集 that was published in 2011. Udon Entertainment is the publisher for this English edition. It's a large 128-page hardcover with the same cover art as the Japanese edition. 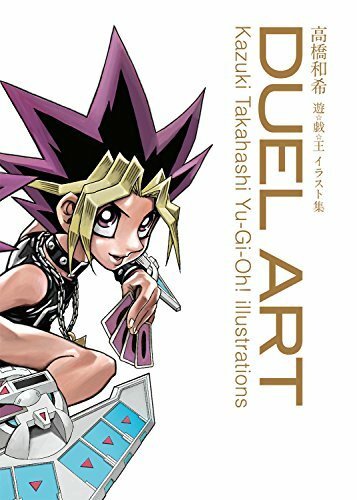 The artbook collects the artworks of Yu-Gi-Oh! creator Kazuki Takahashi. While there is a handful of card illustrations, the bulk of the book features illustrations created for the print media, such cover illustrations for comics published in Shueisha Bunko, Weekly Shonen Jump as well as promotional art. Also included are line sketches of different characters. The earliest artworks from 1997 are quite nostalgic. Over the years, Takahashi's style as become more refined. Kazuki Takahashi's stylized illustrations are about as Japanese as it can get. Yugi Mutou probably has one of the most recognisable hair style in Japanese pop culture. LOL. There are two tutorials on the process of how the illustrations are created from scratch to the final stage. That's followed by a lengthy four-page interview that talks about the creation Yu-Gi-Oh!. Fans of the series should like this book. The Japanese edition is very favourably rated.